I get emotional about lilacs. My grandma had them growing beside the front porch on Manomin Street, my five-year-old daughter used to pound their blossoms into “lilac perfume,” and along with that other spring staple, the peony, they always adorned the graduation stage at the school where I spent 25 years. During lilac season, I put them in every room in the house. I think that lilacs are a more authentic resurrection flower than their expensive and regal cousins, the lilies, Without fail, the lilacs appear when the sun warms the ground, in alleys and farmyards, by lakeside estates and vacant lots. Driving out of the city recently, I saw lilac hedges next to windswept farmsteads and realized that the lilacs had been there as long as the farmhouse had – possibly longer. The ones in my alley are older than I am by a long shot. One of my favorite writers, Patricia Hampl, writes a lot about lilacs, and coined the term “lilac nostalgia.” She points out that the lilacs are immigrants, first brought to the Midwest by Czech immigrants, carefully-wrapped roots important enough to be given precious space in loaded parcels and trunks. They were brought here, and they thrived. They still do. They are early flowers, spring flowers, just as Christianity is “a religion of the dawn,” as my friend Devon says. When the lilacs bloom, you know spring is here. We have survived winter again. New life is appears and the lilacs announce it as boldly as the angel did at the tomb. This morning the basement project began in earnest. First, the wallpaper from 3 decades ago came off the walls and then up the stairs and out the door. The moldy carpet was peeled back, and the pad torn up. A half wall was knocked down and added to the rubbish heap. Underlying our quest for improvement, even self-improvement, is a fantastic assumption, a hopeful assumption – as Longkee reminded us last Sunday, our quest for betterment is predicated on the belief or the hope that things can and will get better. Some have described this as a belief in the reality that the universe arcs toward the good and the positive. As Christians there is something of this belief at the core of our faith. However, the difference is that while we believe things get better, we also believe that it is not by our own hard work and initiative – which is to say, things get better by the good and gracious power of God. That is our faith. Resurrection faith. Easter faith. It is not our job then to change the world – for in the resurrection of Jesus from the dead, the world has already been changed. It is not our job to defeat death, for in God death holds no dominion. Rather, it is our task to point out the reality that the world is different, that death is defeated, that sin and oppression and slavery are no longer legitimate ways of being in the world. It is our job to live in hopeful witness to the change already effected in and through the life, death, and resurrection of Jesus the Christ. This is a subtle shift, to be sure, but it is one that we ought to pay attention to as we seek to live lives that are faithful to the gospel. To that I can only say, Amen, and thanks be! “April is the cruelest month,” wrote English poet T.S Eliot. It’s the intensified contradictions. The promise of the perennials pushing through the earth, the delicate beauty of the bleeding heart already blooming in the garden, everything greening up. But also the specter of yard work in the heat of July, the fact the deck needs repainting before the pots can be brought out and the geraniums planted, the illusion that everyone else will be enjoying picnics, barbeques and trips nonstop, and the daunting mandate felt by many of us Minnesotans to “make the most of every weekend,” makes spring well, complicated. This glorious spring Easter season at St. John’s is also is a time of difficulty for many in our community: illnesses, surgeries, hospitalizations, family stuff, even the loss of a beloved 19-year-old nephew. We stand in the light of the resurrected Christ, but life can be brutal. The Cross showed us that. 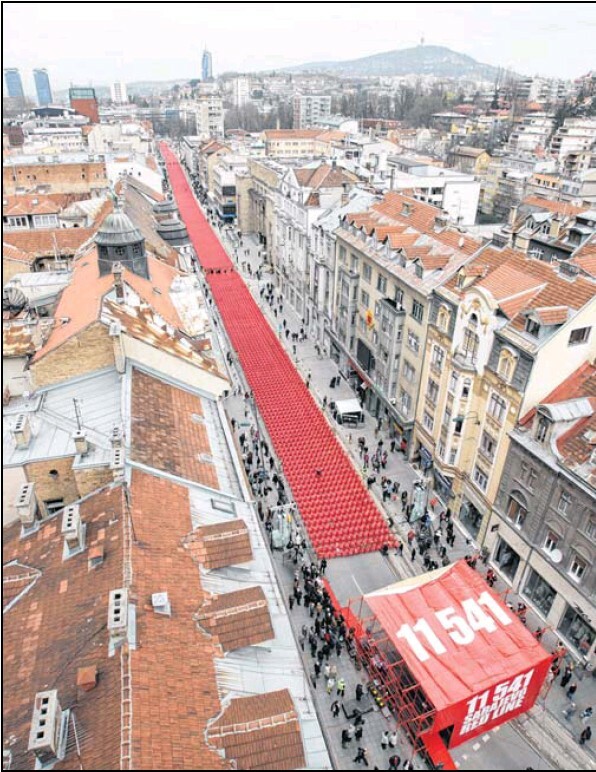 The picture is from an article in a recent Star-Tribune on the 20th anniversary of the siege of Sarajevo, the start of the Bosnian War. There are 11,541 chairs in 825 rows, each representing someone killed during the siege. Hundreds of the chairs are small, many with teddy bears or plastic cars placed on them, representing the 825 children killed. It is a sobering red carpet running through the heart of the city. Joseph Stalin observed, “A single death is a tragedy. A million deaths is a statistic.” So while we feel the strain of the ongoing stress of a world where so much is brutal and cruel, the pain of those in our midst – as well as our own angst — is less easy to dismiss. The call to reach out to each other in love sounds loudly to those of us who follow Jesus. We know this. I logged in to my email this morning to discover an advert for an office supplies company proclaiming loudly in my inbox – “EVERYTHING MUST GO!” It appears even businesses undertake the tedious work of spring cleaning. The world has tumbled rather quickly for us in Minnesota into spring and all her many shenanigans. It is a messy time. The yard is still soft, the mud clings to our treads, and the longer brighter days shed unwanted light on the dust bunnies and the bric-a-brac that have accumulated during the winter of our lives. And so we attack the clutter in hopes that if we can at least get our homes a bit cleaner, perhaps we too will feel better by default. And it does work, if only for a moment. This is why the church, in her wisdom, has invited the faithful over the centuries to the observation of a holy Lent, a time when we clean out the clutter and detritus of our lives. Such a cleansing and a purging create space for simplicity and focus and a chance to notice just how full our lives truly are with the presence of God. During Holy Week this urge to put away the clutter and excess is intensified. Last night, as we worshipped in the half-light of a darkened church, and as the choir sang the stark words of Psalm 22, the altar and remaining decorations and embellishments of the church that had not yet been covered or removed during the season of Lent, were trundled out of the chancel and into waiting offices and halls. All that remained was the body and blood of Jesus. These we processed reverently to the side altar and with votives lit, we stood or knelt, and we watched and we prayed, and we let the knowledge of the presence of God seep into our very being. 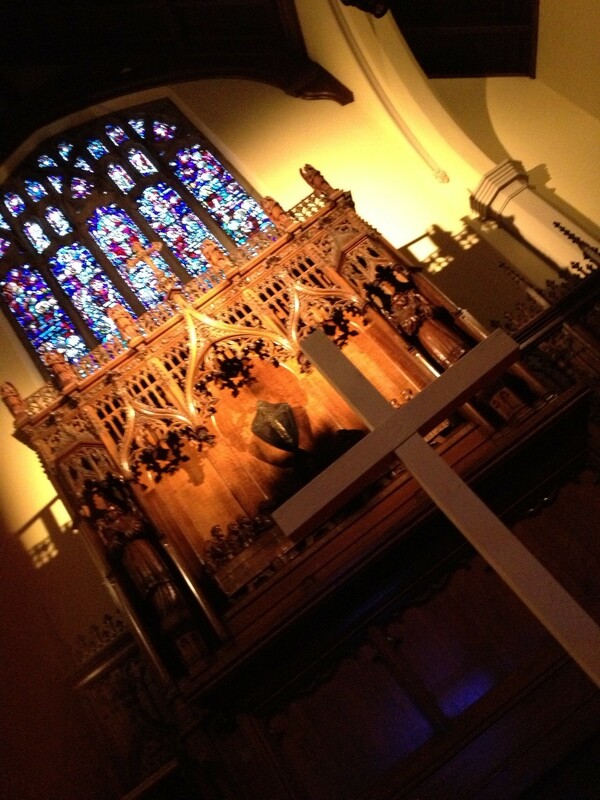 Today the church will be closed and darkened save for our two remaining services of Good Friday (12 and 7 PM) and then, in a rush, on Saturday night (7 PM) the world will return to its beautiful, full, busy, and gloriously cluttered self as we shout our alleluias and ring bells. Only, it won’t be all the same. If we truly take this time, to kneel or stand in silence, amidst the stark and uncluttered halls of Good Friday, then we will know that God is with us and because of this, nothing is ever the same. God is in the details, someone said. We are blessed at St. John’s in countless ways, and one of them is in the gift of an ornate, gorgeous worship space, rich in details with intricate wood carvings on almost every surface, and exquisite stained glass. The altar itself is adorned with brocade hangings, silver cruets, chalices, fine linen and candlesticks. Cushions are needlepoint, in deep, rich colors. Flowers lend their bright presence every Sunday except Palm Sunday. Your eye cannot travel far without encountering ornate details and lush beauty. Thursday night, all day Friday, and Saturday before the Vigil, we come to church to experience absence, to be without. Many of the beautiful details that nurture us each week are gone: the hangings, the silver, the cushions, the candlesticks – virtually everything that can be moved out is moved out. The lights are extinguished. The organ is silenced. 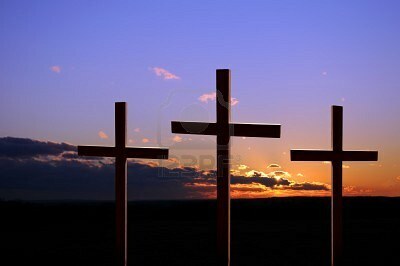 Even the crosses are covered in black, the familiar image removed from our sight. And what we hold on to for two days is only the promise that it is not the end. On the many Holy Weeks in our own lives, when we are suffering and feel most alone, we know that living on a promise while being without much else is difficult indeed. Holy Week sacramentalizes those times – it marks them as holy parts of human experience — which is why it is so important we don’t just skip mindlessly over everything between Palm Sunday and Easter. Life simply isn’t like that – a parade and then a party. Do we believe it all? Believe that it happened? Believe that this story is about God’s love for each of us? Where do we find ourselves in this incredible story? I answer this question for myself with an observation by the writer Barbara Brown Taylor, who says that if we focus only on one detail of Holy Week – the Cross of Jesus – we miss some of the point. She reminds us to pull back the camera, include more details in the scene, and remember that Jesus was not crucified alone at Golgatha that day. On one side was the thief who believed in him and asks Jesus to bring him to paradise with him. On the other cross is the thief who derides Jesus and mocks him. See you there – in church.